Shown are the links among the ocean’s biological pump and pelagic food web. Light blue waters are the euphotic zone, while the darker blue waters represent the twilight zone. Nothing dies of old age in the ocean. Everything gets eaten, and all that remains of anything is waste. But that waste is pure gold to oceanographer David Siegel, director of the Earth Research Institute at UC Santa Barbara. In a study of the ocean’s role in the global carbon cycle, Siegel and his colleagues used those nuggets to their advantage. They incorporated the lifecycle of phytoplankton and zooplankton — small, often microscopic animals at the bottom of the food chain — into a novel mechanistic model for assessing the global ocean carbon export. Their findings appear online in the journal Global Biogeochemical Cycles. 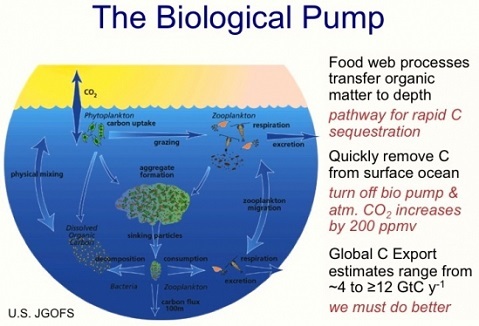 The researchers used satellite observations — including determinations of net primary production (NPP), or the net production of organic matter from aqueous carbon dioxide (CO2) by phytoplankton — to drive their food-web-based model. The scientists focused on the ocean’s biological pump, which exports organic carbon from the euphotic zone — the well-lit, upper ocean — through sinking particulate matter, largely from zooplankton feces and aggregates of algae. Once these leave the euphotic zone, sinking into the ocean depths, the carbon can be sequestered for a season or for centuries. 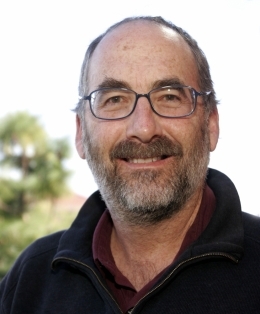 “What we’ve done here is create the first step toward monitoring the strength and efficiency of the biological pump using satellite observations,” said Siegel, who is also a professor of marine science in UCSB’s Department of Geography. “The approach is unique in that previous ways have been empirical without considering the dynamics of the ocean food web.” The space/time patterns created by those empirical approaches are inconsistent with how oceanographers think the oceans should work, he noted. The global carbon budget, shown here with black arrows and values reflecting the natural carbon cycle, and red arrows and values the anthropogenic perturbation. 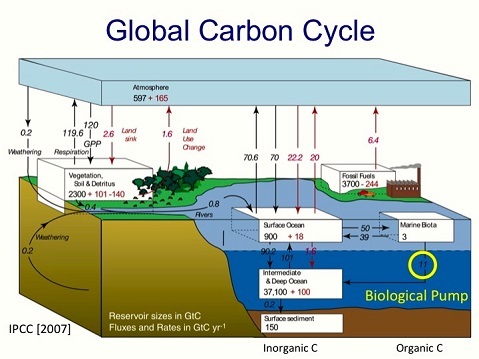 Carbon is present in the atmosphere and is stored in soils, oceans, and the Earth’s crust. Any movement of carbon between — or in the case of the ocean, within — these reservoirs is called a flux. According to the researchers, oceans are a central component in the global carbon cycle through their storage, transport, and transformations of carbon constituents. Their results predict a mean global carbon export flux of 6 petagrams (Pg) per year. Also known as a gigaton, a petagram is equal to one quadrillion (1015) grams. This is a huge amount, roughly equivalent to the annual global emissions of fossil fuel. At present, fossil fuel combustion represents a flux to the atmosphere of approximately 9 Pg per year.